Emerg Infect Dis. 2019 Apr; 25(4): 748–752. In certain regions of New York state, USA, Ixodes scapularis ticks can potentially transmit 4 pathogens in addition to Borrelia burgdorferi: Anaplasma phagocytophilum, Babesia microti, Borrelia miyamotoi, and the deer tick virus subtype of Powassan virus. In a prospective study, we systematically evaluated 52 adult patients with erythema migrans, the most common clinical manifestation of B. burgdorferi infection (Lyme disease), who had not received treatment for Lyme disease. We used serologic testing to evaluate these patients for evidence of co-infection with any of the 4 other tickborne pathogens. Evidence of co-infection was found for B. microti only; 4–6 patients were co-infected with Babesia microti. Nearly 90% of the patients evaluated had no evidence of co-infection. Our finding of B. microti co-infection documents the increasing clinical relevance of this emerging infection. They used serologic testing. Research has proven this form of testing is abysmal: https://madisonarealymesupportgroup.com/2018/10/12/direct-diagnostic-tests-for-lyme-the-closest-thing-to-an-apology-you-are-ever-going-to-get/ Key quote: “These serologic tests cannot distinguish active infection, past infection, or reinfection.”In plain English, these tests don’t show squat. While this study in the link was for Lyme testing, I assure you, serologic testing for coinfections is just as abysmal. All of these coinfections are stealthy and persistent. They purposely don’t hang out in the blood & they’ve developed strategies to avoid the immune system as well as treatment. The fact they only found 1 coinfection isn’t a shocker. Some of the sickest patients NEVER test positive because of dysfunctional immune systems. I’m not sure when they are ever going to think of using a provoking agent to stir the pathogens up, kill them, and then get the dead pieces and parts into the blood where this abysmal testing for antibodies can be picked up, but I’m not going to hold my breath. This study seriously makes me want to bang my head against the wall. They’ve learned nothing and continue to do the same exact things. The only thing they got right was the, “increasing clinical relevance of this emerging infection,” but I’ve got news for them: this is just the tip of the iceberg. They need to get Dr. Breitshwerdt in on these studies and allow him to test the patients for Bartonella using the tests he’s developed. They also need to use provoking agents and then test, or use direct testing, and to drop the EM rash criteria like a bad habit. 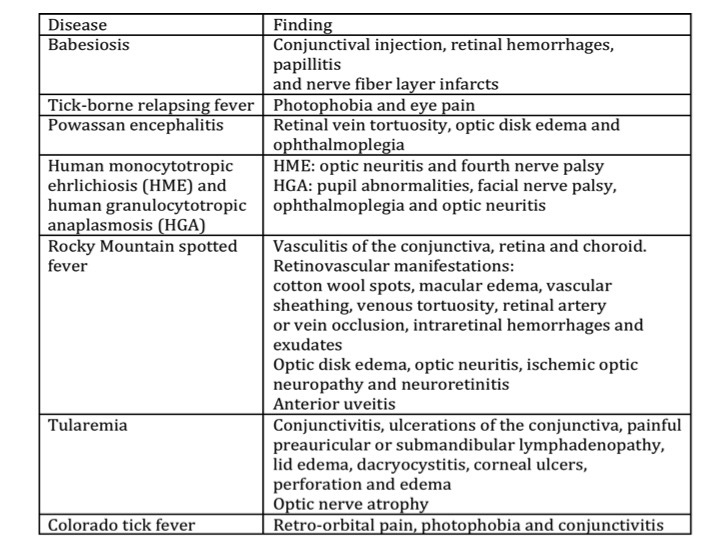 “Knowledge of systemic and ophthalmic manifestations combined with an understanding of the epidemiology of disease vectors is crucial for the diagnosis of tick-borne diseases,” she explains. 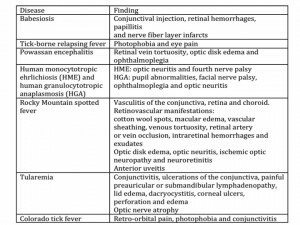 While manifestations may be present with LD and Rocky Mountain spotted fever, ocular involvement is rare in other tick-borne diseases such as babesiosis, tick-borne relapsing fever, Powassan encephalitis, ehrlichiosis, anaplasmosis, and Colorado tick fever, Sathiamoorthi points out. It can also be difficult to determine the cause of the ocular complaints if there is evidence of more than one tick-borne illness. “One case report  describes a patient with optic neuritis and orbital myositis who had serologic evidence of HME [Human Monocytic Ehrlichioisis], Borrelia burgdorferi, and Babesia,” cites Sathiamoorthi. There are more than one species of ticks associated with ocular findings, as well. According to Sathiamoorthi, those include Ornithodoros genus, Dermacentor variabilis Ambylomma americanum, Ixodes scapularis, and Dermacentor andersonii. 1. Sathiamoorthi S, Smith WM. The eye and tick-borne disease in the United States. Curr Opin Ophthalmol. 2016;27(6):530-537. 2. Pendse S, Bilyk JR, Lee MS. The ticking time bomb. Surv Ophthalmol. 2006;51(3):274-279. Wild birds transport ticks into Canada that harbor a diversity of zoonotic pathogens. However, medical practitioners often question how these zoonotic pathogens are present in their locality. In this study, we provide the first report of an Amblyomma inornatum tick cofeeding with a blacklegged tick, Ixodes scapularis, which parasitized a Veery, Catharus fuscescens—a neotropical songbird. Using the flagellin (flaB) gene of the Lyme disease bacterium, Borrelia burgdorferi sensu lato, and the 18S rRNA gene of the Babesia piroplasm, a malaria-like microorganism, we detected Borrelia burgdorferi sensu stricto and Babesia odocoilei, respectively, in an I. scapularis nymph. After the molt, these ticks can bite humans. Furthermore, this is the first documentation of B. odocoilei in a tick parasitizing a bird. Our findings substantiate the fact that migratory songbirds transport neotropical ticks long distances, and import them into Canada during northward spring migration. Health care practitioners need to be aware that migratory songbirds transport pathogen-laden ticks into Canada annually, and pose an unforeseen health risk to Canadians. Blacklegged ticks, which transmit the agents of Lyme disease, babesiosis, and anaplasmosis, disappear in winter, right? Well, not entirely. Although human encounters with these ticks are less likely in winter, there are plenty of ticks out in the environment lurking in a state of (almost) suspended animation. Larval ticks that hatched the prior summer but failed to find an animal host can become dormant and remain on the forest floor in a quiescent state. The same is true of nymphal ticks, which are normally most active in spring and early summer. These two stages are unlikely to activate until day-length and temperature both increase dramatically. Adult stage ticks, in contrast, most actively seek hosts in the late fall. The females that were able to engorge on host blood last fall are overwintering in soil pores or under leaf litter, while slowly converting host blood into eggs that they will lay next spring or summer. Some of the adults that did not find a host have died of starvation or other causes, but the unfed survivors will activate any winter or spring day with above-freezing temperatures. In the southern United States, these ticks can be active all year, but even in the northeastern and upper Midwestern regions, ticks can bite during any warmish spell in January, February, and beyond. As part of The Tick Project, we invite participating households to mail us ticks found embedded in or crawling on people or pets, and we typically receive quite a few even in the coldest months. The riskiest seasons for diseases transmitted by blacklegged ticks are spring and summer, but risk never goes away entirely. And, our 25-years of data from Dutchess County, NY show that, as the climate warms, the ticks come out earlier in the year, advancing the dates of greatest risk. For More: https://madisonarealymesupportgroup.com/2016/01/20/polar-vorticks/ TICK GUY, TOM MATHER, SHOWS HOW TICKS SURVIVE IN 3 DEGREES OVERNIGHT UNDER SNOW COVER. https://madisonarealymesupportgroup.com/2018/08/13/study-shows-lyme-not-propelled-by-climate-change/ Warm winters are lethal to I. scapularis (black-legged) ticks. In fact, overwinter survival dropped to 33% when the snow melted.